KNITTED OCTOPUSES HERE The most tactile octopus toy for your premature baby in hospital. 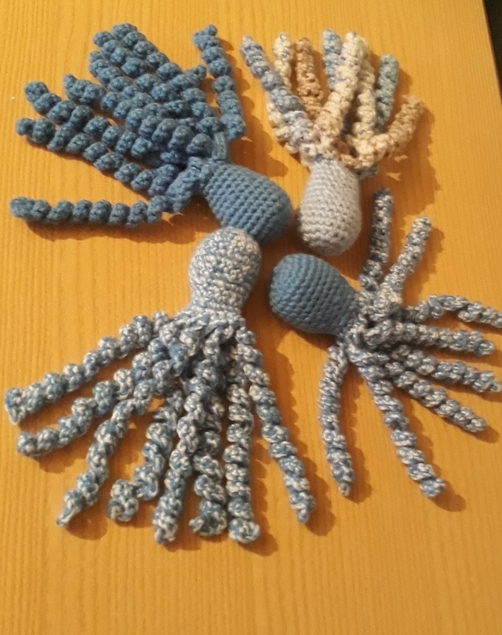 these knitted octopuses replicate the feeling of an umbilical cord just like being in the womb. helps to clam stressed preterm infants. maternity staff have noticed a reduced number of times they have inserted lines into babies since these type of octopuses have been introduced to premature babies.it gives them a form of soothing physical contact making them distracted during intensive nursing care. choose the colour just below then add it to your shopping basket for your baby boy to snuggle close when you are not nearbye.